Tissa Ranasinghe keeps his sculptures on a long, low table in his living room, shrouded in a white bed sheet. Under there, you will find the most unlikely companions – a faceless man astride a flying Garuda; a pair of lovers, entwined; a bull in a Red Indian head dress; the virtuous Kannagi and the determined Bhageeratha; the Buddha when he was but a boy; the Goddess of fire and others besides. They have all sprung from the sculptor’s imagination, frozen forever in mid-step, midflight, mid-kiss. This fascination with texture is intrinsic to Tissa’s work. Sunlight streams down into the little patch of garden where we sit, but Tissa, in a moment of nostalgia, is telling me about nights long past when his young daughter would be admonished, told that if she did not go to bed, the ‘goni bila’ (a bogey man) would come for her. “She couldn’t say, ‘goni bila,’ she used to say, ‘gobi lala,’” he remembers. So, when he came across a piece of gunney sack, he knew what he wanted to do with it. He shows me the sculpture of a sinister figure, touched by yearning, peering into a window. As an artist, it’s apparent that he does not cling to any sense of his own consequence (even though he is indisputably consequential, not only thanks to his wonderful portfolio, but in his legacy as a mentor to sculptors from all over the world). In his speech he is entirely self effacing, and refrains from profound meditations on his work. His new exhibition, on till this Wednesday, August 31 at the Lionel Wendt gallery will feature 14 of his new sculptures and a large number of sketches many of which date back to 1958 when a UNESCO travel grant allowed him to explore Italy and parts of France. “I didn’t have a camera and so I had to sketch. You didn’t have felt tip pens and the like then, so you had to use a bottle of ink, a steel nib and a pen.” There are also several nudes – “they always sell pretty well,” he grins. Among the sculptures are the subjects of his long obsession – the Garuda, the androgyne and the lovers all stray into ambiguity. Tissa says he continues to be fascinated with the figure of a man blurring into a woman, where man and monster are two facets of the same being; the moment when the mortal is on the verge of godhood or where the god is made mortal by love or rage. Though he still creates the original plasters, Tissa no longer casts his own bronzes, preferring instead to send the plaster work directly to a foundry in Thailand where the actual casting is done. As if to echo the 1970s when times were hard for sculptors like himself, he says the price of bronze continues to rise. This has prompted exhibitions of plasterwork for bronze, where viewers must imagine the end product. 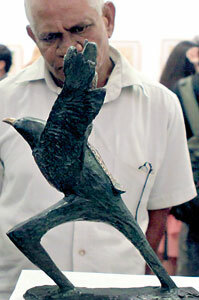 The cost of producing each sculpture is one reason why Tissa says he is still sometimes nervous before an exhibition – that and the irrational suspicion that “nobody will turn up.” Fortunately, unlike the Italian Renaissance sculptors he so admires, Tissa has chosen to have his life be about more than his work. In the meantime, he will be returning to London in September, having staged what he says might very well be his last exhibition in Sri Lanka. Still, his pièce de résistance remains uncast – “once you’ve done something perfect, you can’t go beyond that,” he says. Still the promise of that perfect sculpture gives him, and us, something to look forward to. 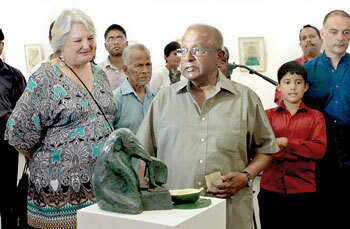 Tags: art, Garuda, Lionel Wendt, Sculpture, Tissa Ranasinghe. Bookmark the permalink.